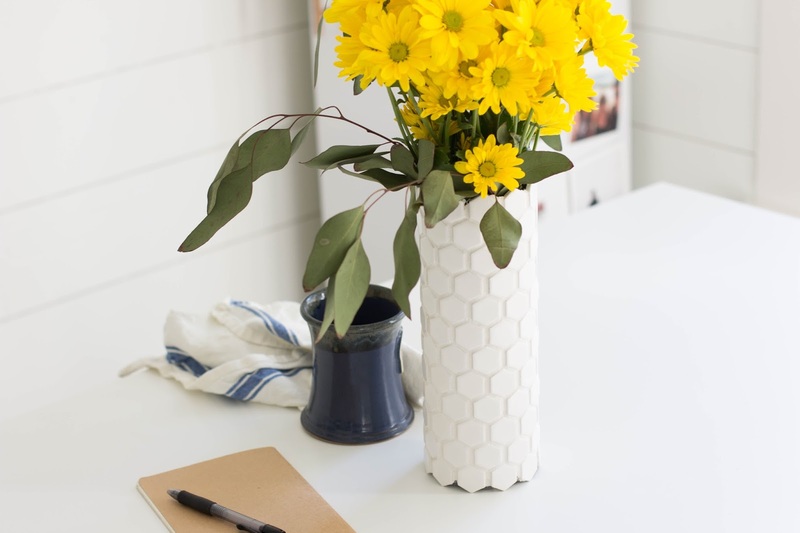 This vase! I'm adding it to my favorite DIY list. I originally bought this tile thinking it would match the tile in our bathroom. Unfortunately it was not a match, but as I was holding the sheet of tile I realized it would be a great vase. I recently helped a friend tile her backsplash for the first time and I'm hooked on tiling...you have to try it! Since she had leftover materials, I used her mortar and grout to make this project easier. Plus a few extra friends let me borrow their tiling tools. Lesson: ask your friends for help if they just finished a tiling project! This is a great project if you are wanting to learn how to tile but don't have a backsplash or floor to tile. I love how versatile it is and how it can be easily customizable to fit different styles. I also think it would be an inexpensive way to make multiple table settings for an event since the tile and vase are so cheap! 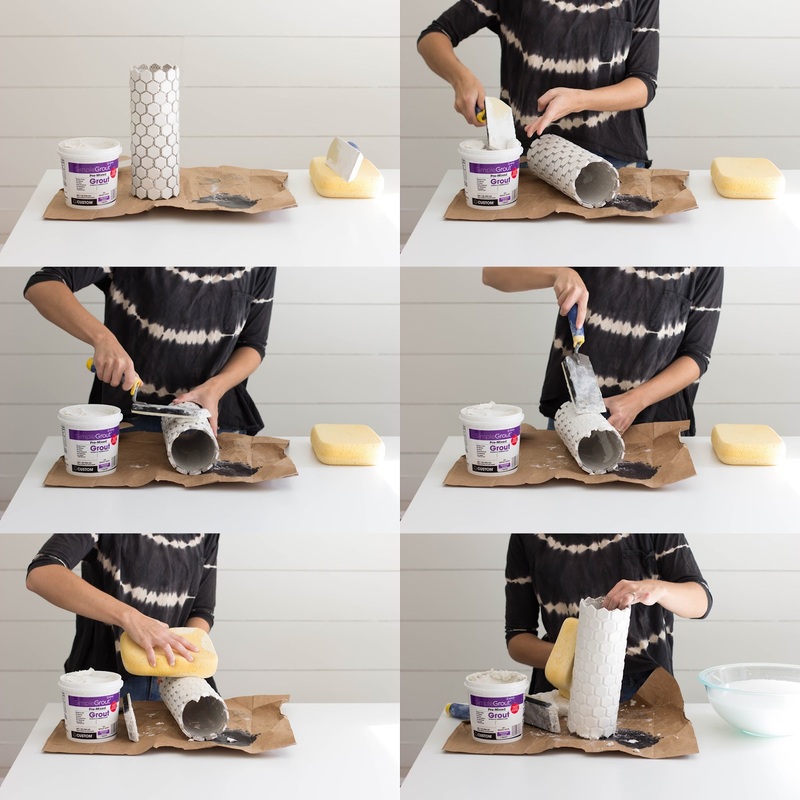 How-To: Scoop a large amount of tile adhesive with a putty knife or trowel and spread on a small section of the vase. Spread evenly vertically and using the teeth side of the trowel, make grooves in the adhesive. Line the edge of the tile sheet against the adhesive and press into place. Continue to spread, groove, and press the tile into the adhesive until you cover the whole vase. When the tile makes its way around the vase, cut off the excess tiles. Allow adhesive to dry for 24 hours. How-To (continued): After you let the tile and adhesive dry for 24 hours, time to grout! Using the grout trowel, scoop a small amount on the tile. Smear across at a 45 degree angle across a small section of the vase. Take the opposite side of the trowel and remove the excess grout. Now, using the damp sponge, remove the grout on the tile in a circular motion. You'll repeat these steps until the whole vase is grouted. Make sure your sponge isn't too wet, squeeze out the water before you clean off the grout. 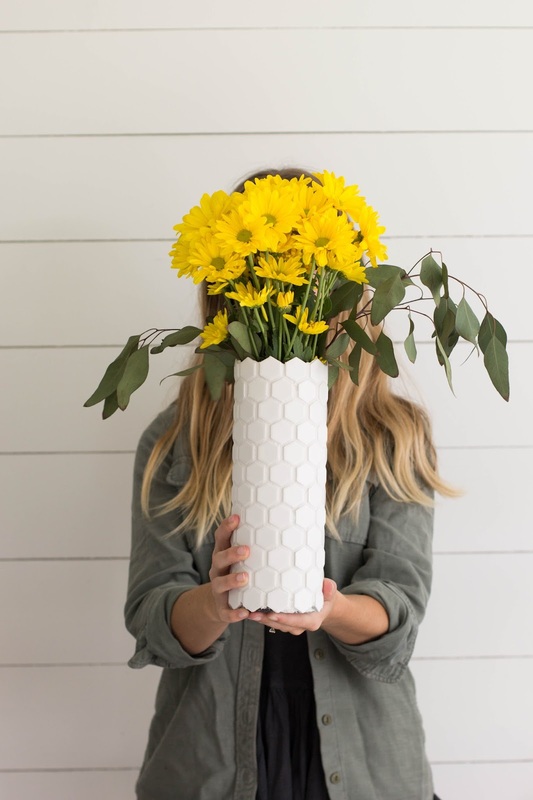 After the vase is covered, allow to dry up to 24 hours, fill with water and your favorite blooms! What do you think? 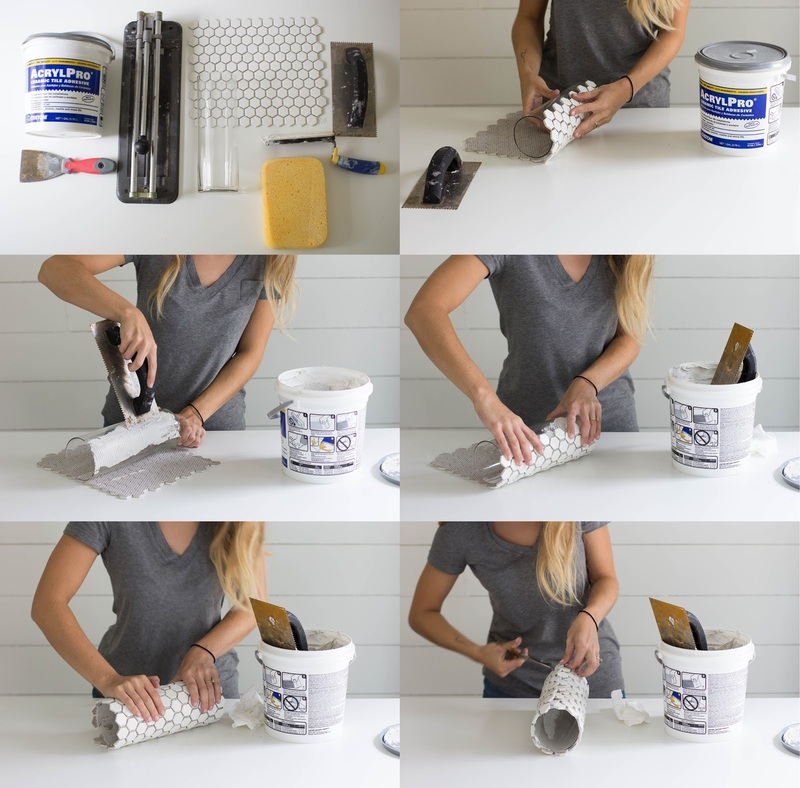 Have you ever tried tiling before?! I love this! I'm decorating a rehearsal dinner next month and I may have make a few of these to go in the centerpieces! Thanks Sarah! That's a great idea to use it as a centerpiece! The more you make, the easier it will be! Oh this is so easy, how great! You wouldn't believe how many of those cylinder vases I've had in my life - I've had to get rid of so many! 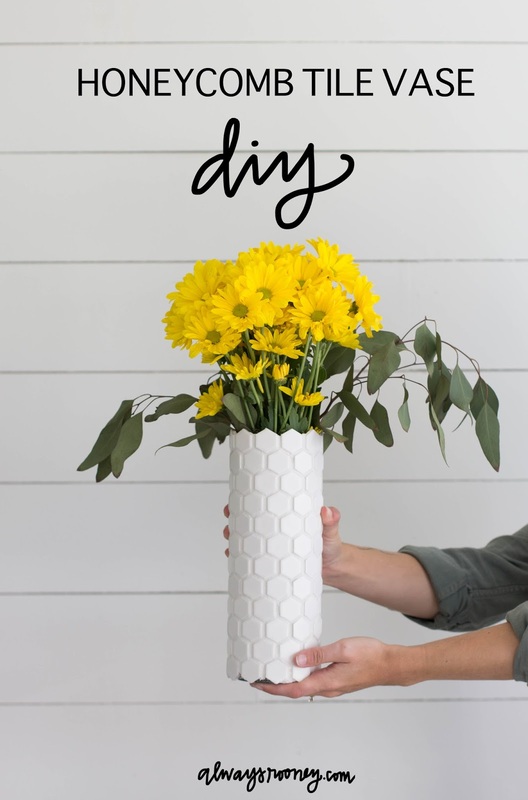 This is a great way to repurpose them, and I even like the idea of having all white tile vases, but with different shape tiles for visual texture! I love the idea of having different shape tiles for visual texture! Thanks, Yelle! I think it would look perfect in a kitchen! I love this idea! 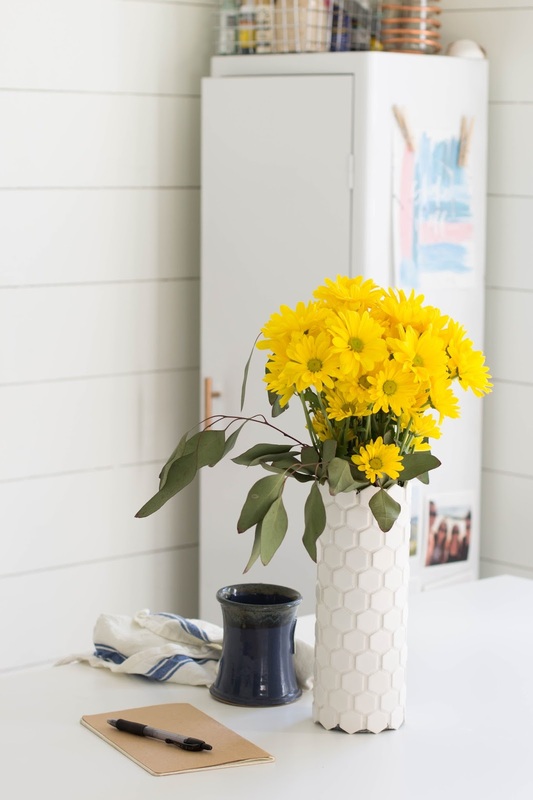 Would you mind sharing where you got your tile and vase from. 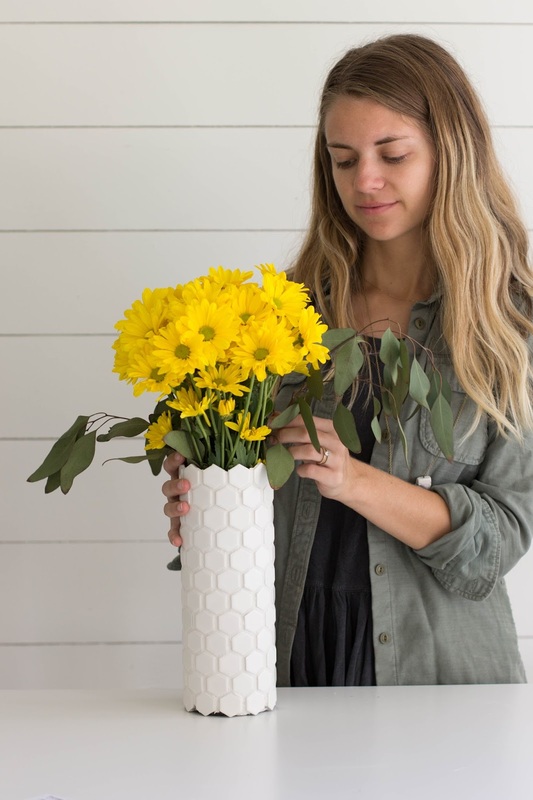 The link to the tile is in the post, and I got the vase from Target!